After losing his leg to a land mine in Afghanistan, Cormoran Strike is barely scraping by as a private investigator. He's down to one client, and risks losing even his office--where, after breaking up with his longtime girlfriend, he's currently living. Then John Bristow walks through his door with an amazing story. His sister, the legendary supermodel Lula Landry, known to her friends as the Cuckoo, famously fell to her death a few months earlier in a seeming suicide. The case plunges Strike into the world of multimillionaire beauties, rock-star boyfriends, and desperate designers, and introduces him to every variety of pleasure, enticement, seduction, and delusion known to man. 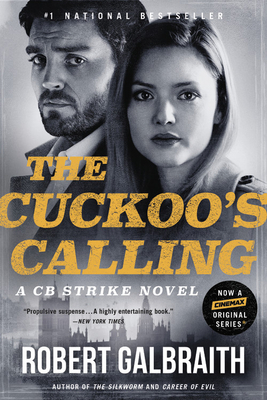 Introducing Cormoran Strike, The Cuckoo's Calling is the acclaimed first crime novel by J.K. Rowling writing under the pseudonym Robert Galbraith, soon to be a major TV series for HBO. Robert Galbraith is the pseudonym of J.K. Rowling, author of the Harry Potter Series and The Casual Vacancy.